Mad Hatters Teapot: It’s National Sweater Day on Friday, March 20! It’s National Sweater Day on Friday, March 20! In honor of Mr. Rogers Birthday, March 20, It is National Sweater Day! So put on your sweater and take off those loafers and be someones neighbor today! 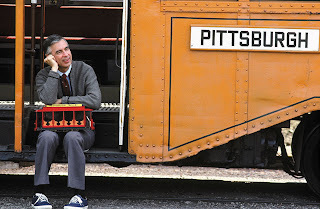 Mr. Rogers was one of the first to really encourage all of us to be better people and knew that starting character-based discussions about respect and open-mindedness needed to start early. He was the right man, with the right message, at the right time! So, won't YOU wear a sweater on Friday, March 20th? To Honor of Mr Rogers Birthday, I would like to give a gift of sending a real paper greeting card in the mail to someone special in your life. Send a heart-felt note to someone who has made a difference in your life! No Strings! No Risk! 3. You will be guided through sending a Real paper card! You Click Send and We Do The Rest! *Be sure you have the latest browser as we are using the newest technologies.